This demonstration uses lots of richly colored layers. Here is the photograph I worked from. I generally do a simple outline drawing, then blow it up to the size I want to paint. My first layer of wash I call the “Base Layer”. 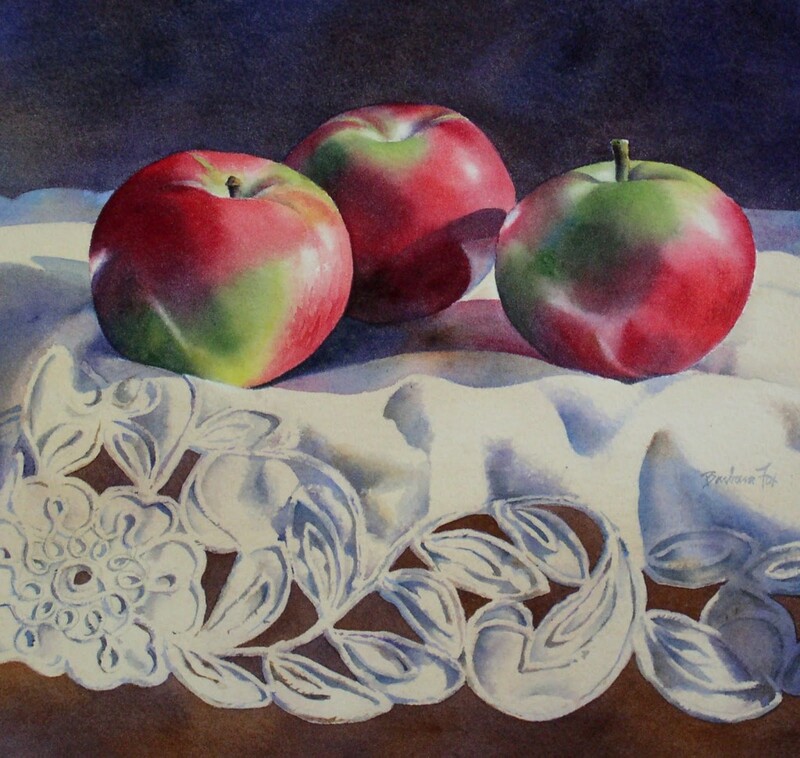 This is generally a wet on wet wash using the actual colors of the subject, in this case, red and green for the apples (Permanent Rose*, Napthol Red, and Sap Green). 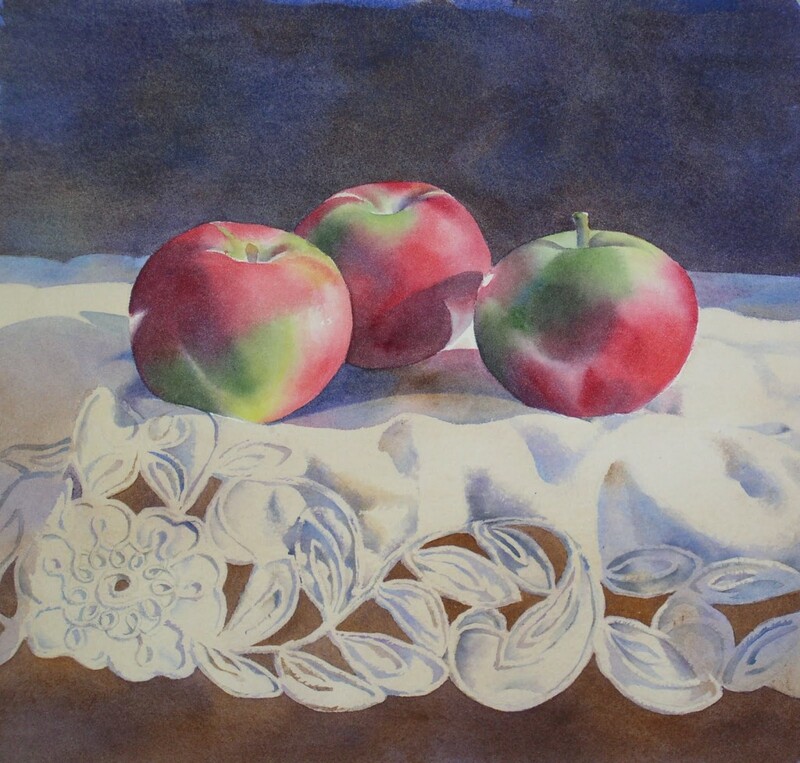 The apples were first wet with pure water, then the colors were applied by just touching the brush to the paper. 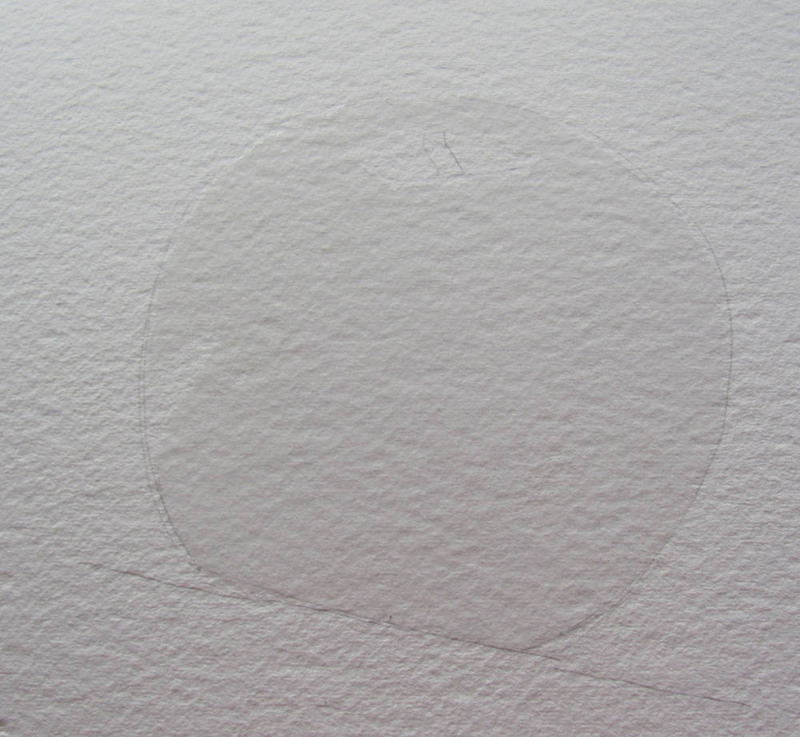 The paint is carried by the water, and the 2 colors mix beautifully, with just a few nudges of the brush. Too much brushwork at this point would muddy the colors. Remember, there are lots of layers of color to come, so there is plenty of time to tweak the image. Also, leave white areas for the very light areas and highlights on the apple. Then the colors were applied by just touching the brush to the paper. Leave white areas for the very light areas and highlights on the apple. 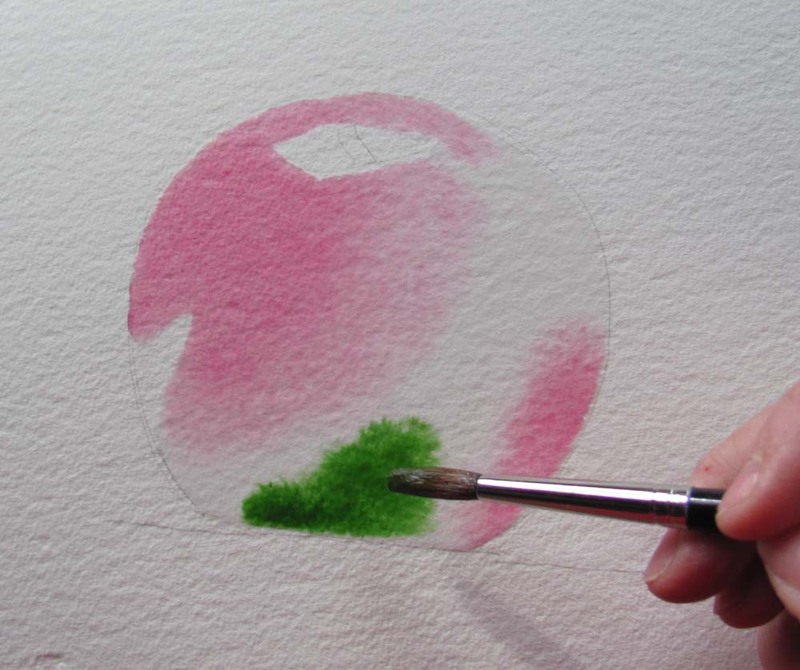 The paint is carried by the water, and the 2 colors mix beautifully, with just a few nudges of the brush. An extra bit of Permanent Rose on the lower left side, and blotting the hard edge around the stem. The wash under the lace material is Burnt Sienna, Dioxazine Violet, and Permanent Rose, all flooded into a wet wash. Again, notice how well they mix when added to the wet paper. The background wash is Burnt Umber, Dioxazine Violet, and Ultramarine Blue. 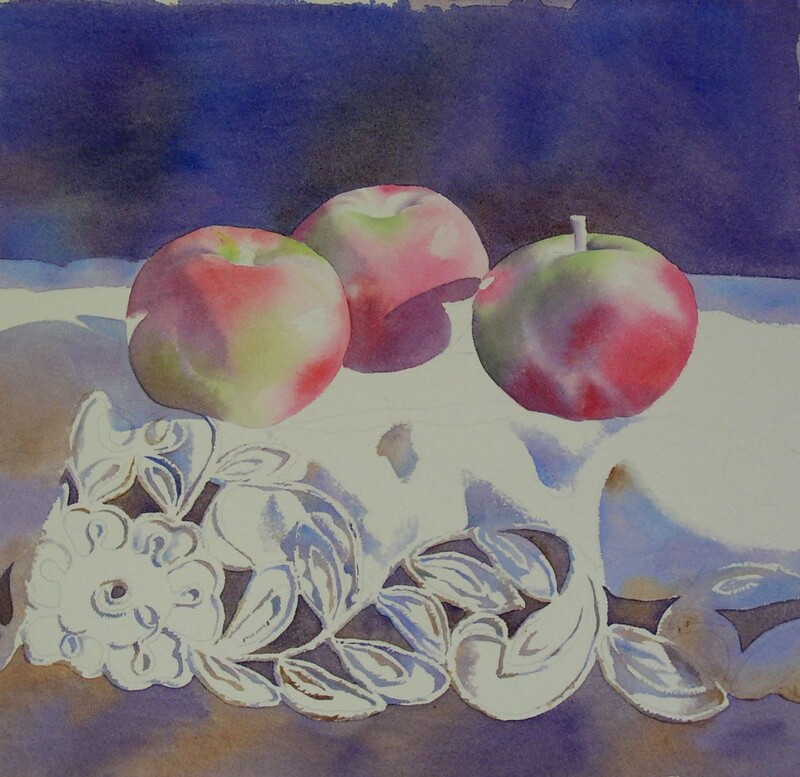 I use Dioxazine Violet to paint the shadows on the apples, leaving the highlighted areas. I begin painting the shadows and the detail on the lace using Dioxazine Violet, Cobalt Blue, and Raw Sienna. I don’t mix them, but just dip my brush into a different color from time to time, and let them mix themselves. It can look a little garish at this point, but I know I will be painting over them again , and the shadows will eventually be darkened which will unify the colors. The lace detail and shadow is coming along. Although painting the lace is tedious, I know that rendering it carefully will make a better painting. I painted a layer of Ultramarine Blue in the background, and a layer of Burnt Umber below the lace. You can see where I have a few more holes to fill in the lace. 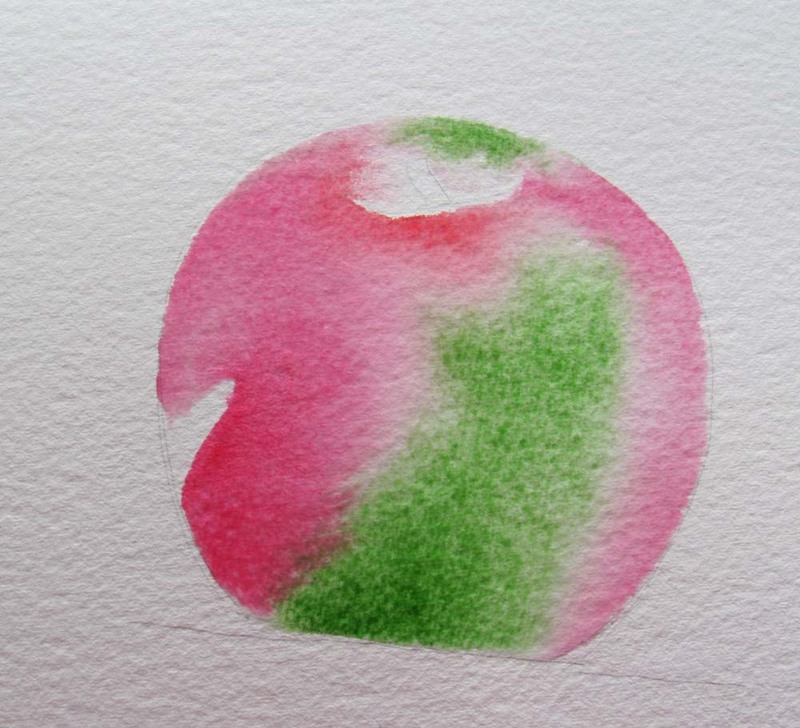 I painted another layer of green (Sap Green) and red (this time Alizarin Crimson) on the apples. For Layer #2 on the apples, I wet the entire apple with water, then flood in the colors**. Remember to leave the highlights. I painted a very light layer of Raw Sienna over the entire lace area. This helps unify the colors that I used for the shadows, and keeps the material from being too glaringly white, and attention grabbing. The painting needs deeper shadows, and I would like the apples to have richer colors. 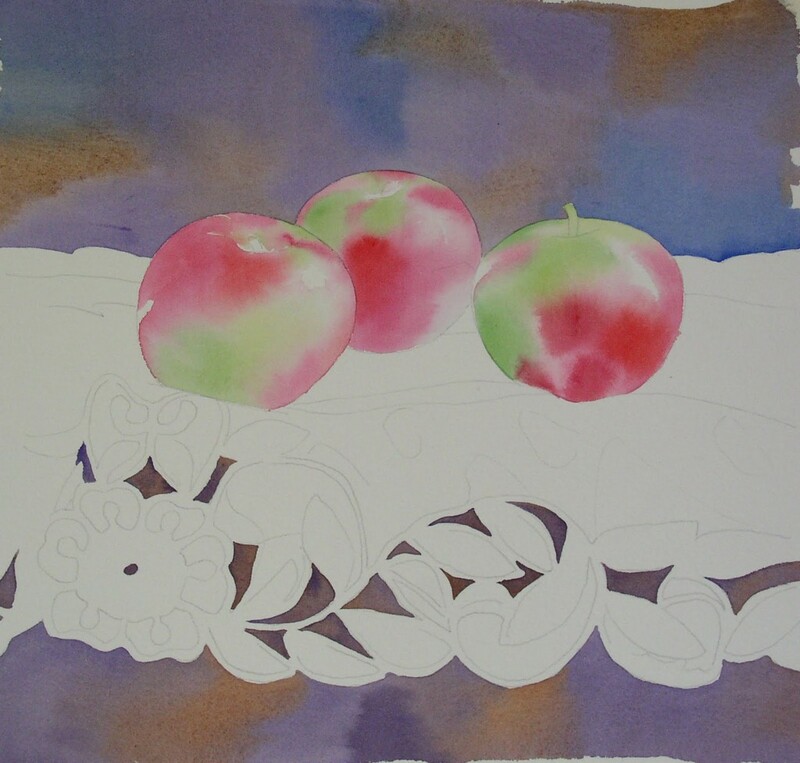 I paint over the apple’s shadows using Dioxazine Purple in the red areas, and Prussian Blue in the green areas. I paint a little Cobalt Blue on the highlight on the middle apple, and a wee bit of Cadmium Orange on the top right of the first apple. I deepen some parts if the folds in the lace, and work on the lace detail a little more. 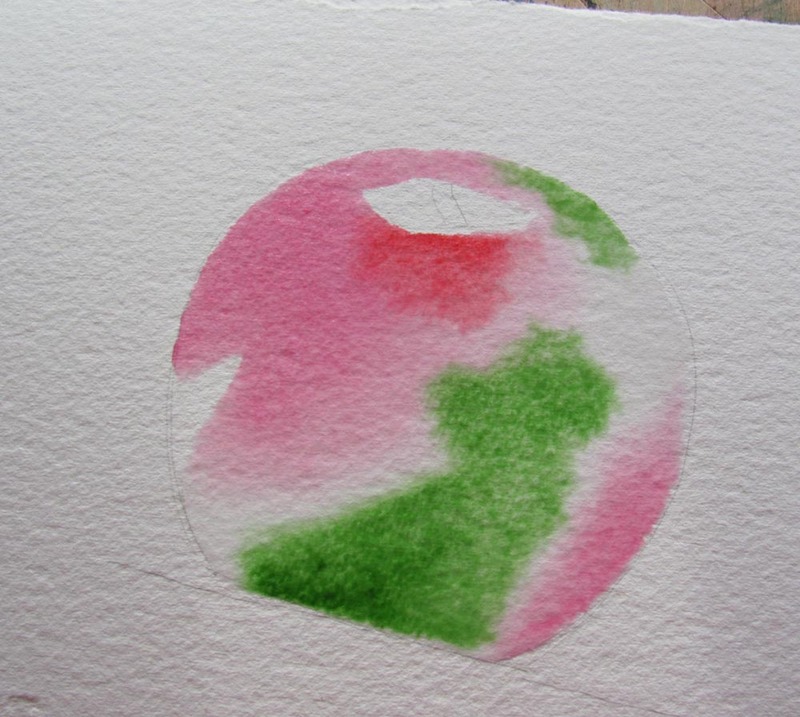 Another layer of Alizarin Crimson and Sap Green on the apple, this time with a little Hookers Green for the cooler green areas. 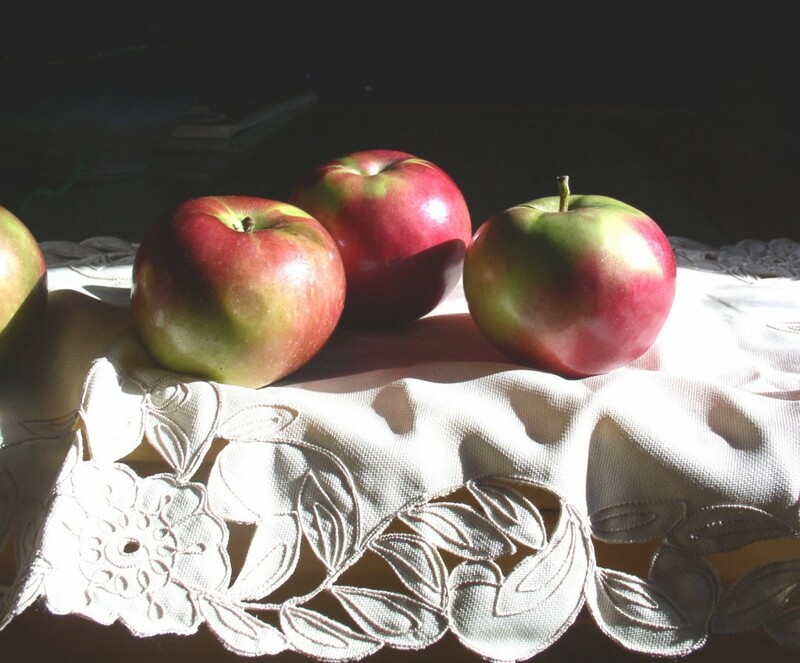 I use Dioxazine Violet and Sepia on the stems of the apple. 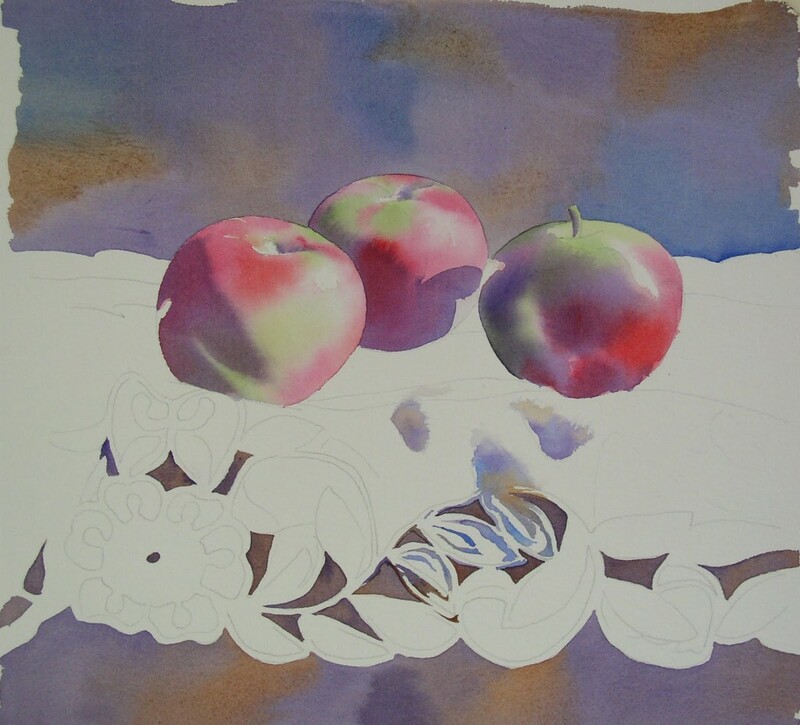 I deepen the shadows between the apples using Dioxazine Violet and Ultramarine Blue, with a little Alizarin Crimson. 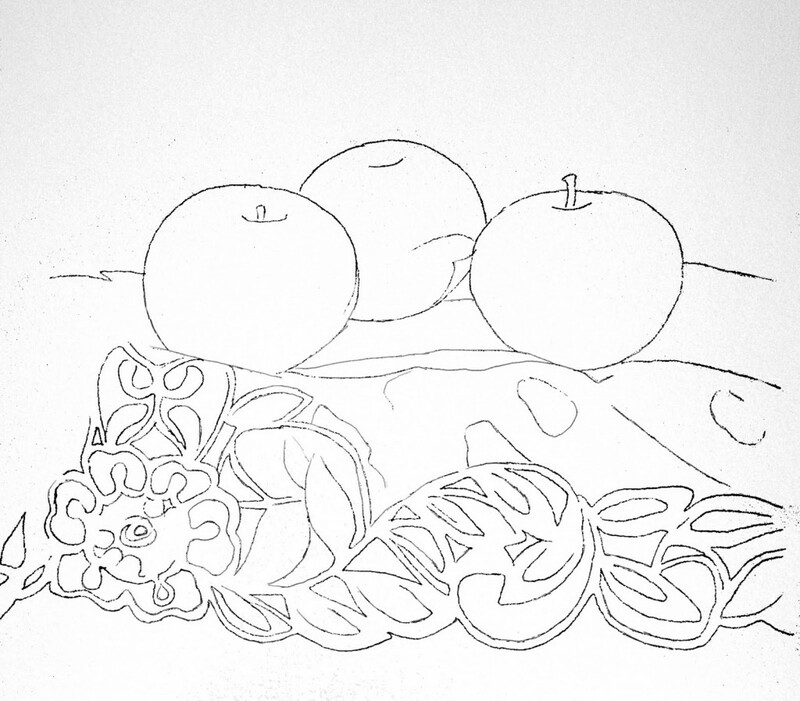 The final step is making really dark areas darker (the stems, and shadows right under the apples), and lightening some highlights. I scrub out some lighter areas around the stems, and the highlights and reflected lights with a small, stiff brush and plenty of water. * when painting a red subject, I usually start with Permanent Rose. 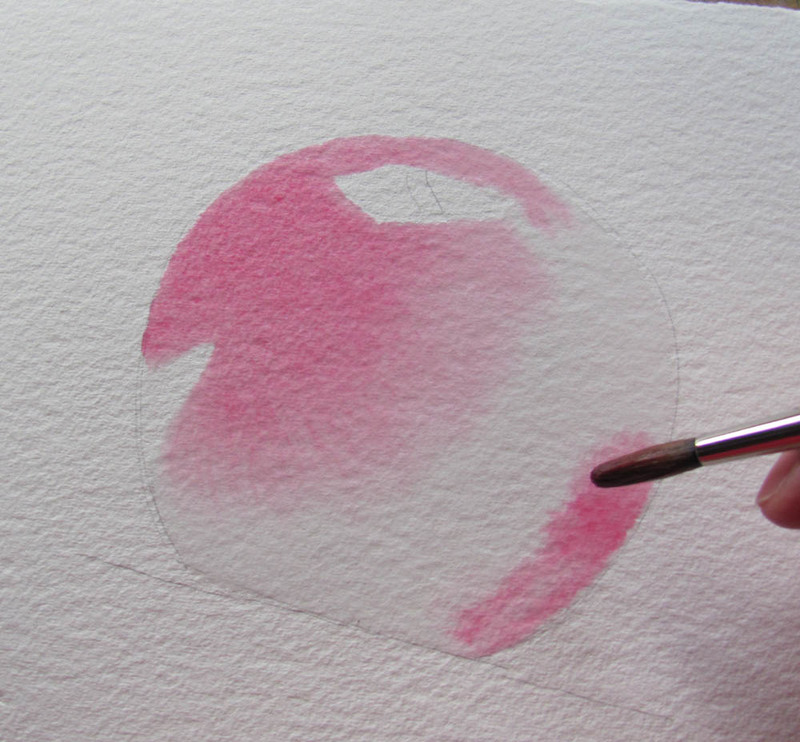 It is a rich and warm pink, and looks better then a lighter wash of Alizarin Crimson. 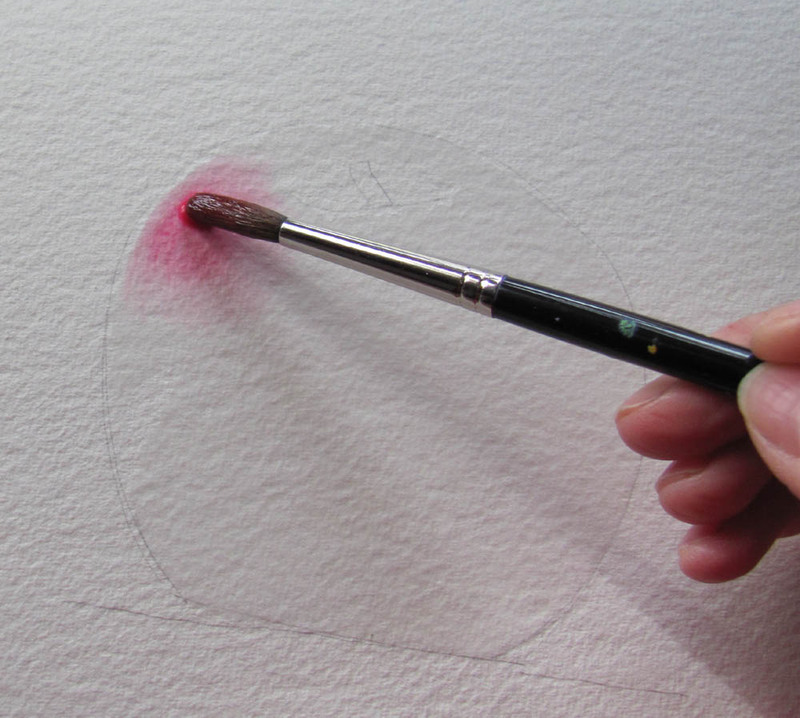 I use Alizarin Crimson for dark, intense reds, but a washy version looks dull to me. ** Doesn’t the water wash out the color underneath? No, not as long as you aren’t brushing it too much. The dry paint will stay put for the most part, unless it is disturbed with a lot of brushing. Water, good, Brush, bad. *** Why so much Dioxazine Violet??? Not quite sure why, but I love it. It is a lovely purple, but also the perfect neutral. It seems to work great as a shadow color on any other color, and seems to cool when a color needs to be cooled, or warm when a color needs to be warmed. Take note, that I almost never mix it with another color, but use it as a wash over another color. and they said watercolor is for amateurs. Thank you so much! Great technique and explanations! Awesome tutorial 🙂 This is exactly what I was searching now. Please tell me what is the ‘pigeon’ watercolor painting technique.